This is a great little board containing an EGBT-045MS Bluetooth Module, voltage regulation, logic level conversion and LED activity indicators. These modems work as a serial (RX/TX) connection, and are a great wireless replacement for serial cables. 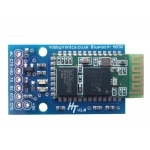 The HT Bluetooth Module has the same pin out as the FTDI Basic 5V, FTDI Basic 3.3V, Bluetooth Mate Silver and can plug directly into Arduino Pro, Pro Mini 5V, Pro Mini 3.3V boards. The EGBT-046S Bluetooth Module is a generic Bluetooth device loaded with SPP firmware for UART wireless cable replacement functions. This version of the board can act as a MASTER or SLAVE device. 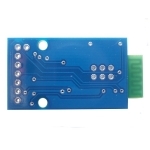 The module has two modes of operation, Command Mode where we can send AT commands to it and Data Mode where it transmits and receives data to another bluetooth module. The default mode is DATA Mode. 1. Connect the CMD pin high before applying power to the module. This will put the module into command mode at 38400 baud. This is useful when you dont know the baud rate the module is set to. 2. Apply power to the module then pull the CMD pin high. This will enter command mode at the currently configured baud rate. This is useful if you want to send AT commands from say a microcontroller as the CMD pin can be controlled from one of the microcontroller pins. Apart from the commands described below for configuring master/slave operation, the following useful commands are available. 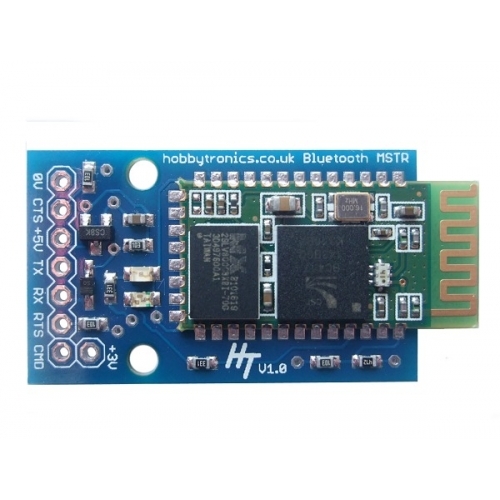 To configure the module as Bluetooth Master and to pair with another bluetooth module follow these steps. Firstly we need to put the module into command mode as above by pulling the CMD pin high. Follow these steps in order. We need to replace the colons with comma's when we use the address with the following commands. Once we are happy we have the correct slave address, we need to pair with it, so carry on with the next set of commands. AT+PAIR=<address>,<timeout> The timeout is in seconds and if you need to type in the pin on the slave device you need to give enough time to do this. AT+LINK=<address> Connect to slave. Blue led on board should light up. The bluetooth module can also act as a slave. There are fewer commands to set this up. In the video we setup the module as a Master and connect it to a slave module.